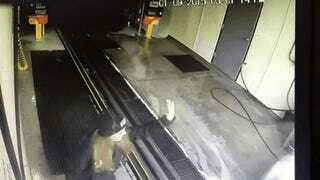 When a customer confuses the gas for the brake, allowing them to drive completely straight through your beautiful, expensive car wash, leaving a path of wanton destruction in their wake, you'd expect the proprietors to be upset. Not at the Quick Quack Car Wash. They took the video, set it to music, and perfection was born. Fortunately no one was seriously injured when a customer stepped on the gas instead of the brake and flew through the car wash at high speed. Notice the other customer leaving the vacuum area just seconds before this one crashes. We are proud of our staff for their professionalism and amazing responses. We were back up and running in just a couple of days! But I'm not sure their description does it justice. Not at all. Below, I've decided to print my own description of what happened, including the music. A car wash. Specifically, the old Quick Quack. It's a masterpiece in video advertising.